The Red Trek Slim Sole Hoof Boot has all the great features of the Trek hoof boot with a slightly more narrow sole. Cavallo Red Trek Slim Sole Hoof Boots are the most flexible, durable, breathable and user friendly addition to the Cavallo hoof boot collection. Red Trek Hoof Boots, with the honeycomb design, maximizes strength and minimizes weight for the comfortable performance your horse deserves. Great for the relief of chronic pain or hoof sensitivity; rehabilitation from injuries, abscesses, navicular disease, laminitis / founder, punctures, sole bruising and contracted heels. 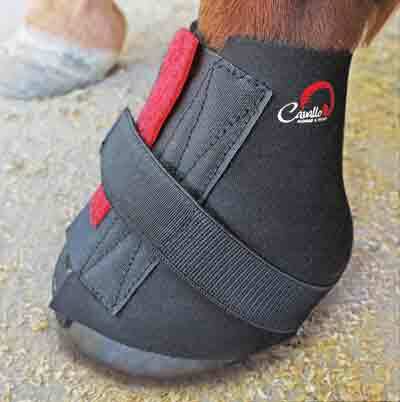 Additionally, the Red Trek Hoof Boot can easily be adjusted for close contact and snug fit to individual horse’s hooves. Can be used for protection during trailering and breeding or taken on the trail as a “spare tire” for lost shoes. The newest addition to the Cavallo line of hoof boots. RedTrek is simple to put on and remove and stays securely on the hoof. The upper is made from Pro Mesh moulded TPU and replaceable Velcro closure are both exclusive to Cavallo Hoof Boots. The honeycomb design of the Pro Mesh optimizes strength and minimizes weight. The regular sole accommodates a hoof that has a rounder shape while the slim sole fits a more oval shape hoof. My horse is my best friend and knowing that "I've got his back covered" is great. The Cavallo Saddle Pad provides awesome protection and his back is no longer sore on the last day of a 3 day barrel racing weekend. Thanks again from Kayla & 'Kash'!